Sitting a child down with a coloring book can often help calm and focus them — but did you know it could do the same for grown-ups? For over a decade, researchers and art therapists alike have backed the calming benefits of coloring. The first commercially successful adult coloring books were published in 2012 and 2013, but only recently have adult coloring books become popular — a full-on trend, even. Everyone from researchers at Johns Hopkins University to the editors of Yoga Journal suggest that coloring produces benefits similar to meditation. From stress reduction to a means of creative expression, the health benefits of coloring are staggering. 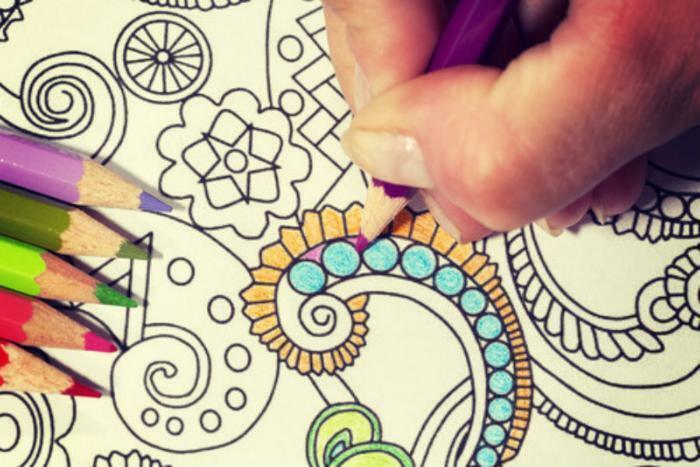 As a way to focus on the moment, adult coloring books can be a valuable tool, experts say. Just like meditation, coloring allows us to switch off our brains from other thoughts, helping to alleviate free-floating anxiety. "Coloring definitely has therapeutic potential to reduce anxiety, create focus or bring [about] more mindfulness," says Marygrace Berberian, a certified art therapist and the Clinical Assistant Professor and Program Coordinator for the Graduate Art Therapy Program at NYU. Groundbreaking research in 2005 showed that anxiety levels dropped when subjects colored mandalas, which are round frames with geometric patterns inside. Simply doodling, though, had no effect in reducing the other subjects' stress levels. For people who aren't comfortable with more creatively expressive forms of art, it can be particularly effective, according to Berberian. A giant blank canvas may be a little intimidating to an anxiety-ridden overthinker. But an eight-by-ten piece of paper with guidelines? That's a little more manageable. It's important to note that adult coloring books are not exactly the same as completing an art therapy session; people dealing with significant mental or emotional issues will find art therapy to be more effective. "Coloring itself cannot be called art therapy because art therapy relies on the relationship between the client and the therapist," said Berberian. But people who are just looking for a way to relax may find these books to be just the ticket. As Berberian puts it, "I truly believe that people should be engaging in activities that make them feel restored." Coloring books for adults can be found at bookstores and craft stores, usually for around $10-$15 each. Amazon’s list of bestselling adult coloring books can be found here.